Telenor has offered its Talkshawk customers to make calls to any network at 49 Paisas per 30 seconds, anytime of the day, at a daily subscription charge of Rs. 3 plus tax. For the purpose, you need to activate Telenor’s talkswhak 63 Package and avail this offer by activating your daily subscription. Call to UK (Landline only), US (Landline and Mobile) and Canada (Landline and Mobile) are charged at 49 Paisas per 30 seconds. TOtal bakwaas why we shuld pau daily chrg nthng interested. abi th0ri dayr mey yahan TELENOR HATERS k comments ki line lagney wali hai kyu k itni achi offer un se hazam h0na t0 do0r ki baat hy unk0 samaj e nae ayega k apni apni sims k sath hum karein kya ab :P keke ..
KEHNI KI ZAROORAT NAHI , MOHAMMAD OSAMA , NO.1 PAY HAIN. OSAMA GI KO TO KOI CHEEZ MUFT BHI DO GA , WOH BHI UNKAY LIYA BAKWAS HO GI. KEHNI KI ZAROORAT NAHI , MOHAMMAD OSAMA , NO.1 PAY HAIN JINKI AKAL KA PATA CHAL GAYA HAI. I would say an attempt to get money (loot) from uninformed/uneducated people, who just look advertisements and go for it without reading and understanding terms and conditions attacthed to it. 3.11*10= approx Rs. 100 per month..
should be good for many subscribers.. especially retailers, merchants and other daily wagers.. whose working requires high “all network” volume..
and who care for 100 rs. a month..
besides call ing more than 20 mins would none the less increase further benefit. 3.11*3*10= approx Rs. 100 per month..
Could be the best offer if Daily charges were Re. 1 per day! not attraxtive for most of the subscribers…. Ache Offer hay magar 3 Per Day Zeyada Hain. rs:1 per day thek hay. LOL 3Rs rent is everything. Rs.3 ziada hain agr Rs.1 ho to acha hai. Indeed a good offer especially for those who calls usa/canada. Iss se accha Telenor 55paisas/30sec kar deta without any daily charges…… iss say phr dosray networks bhi sasti kartay call…… ab doosray networks bhi daily charges rakh kar call sasti karain gay…i think thoray din baad Jazz 5 rs daily charges rakh kar 45paisas/30 kar dega…….. in my point of view not great idea of Telenor…!! Wow, what an offer. Maze Karo Telenor wale bhaio. Good Offer !!! Overall, there is no change but yes you can say little bit good offer in a sense..
telenor nay bhot good pakage dia hay.per day Rs1 hona chayeh. 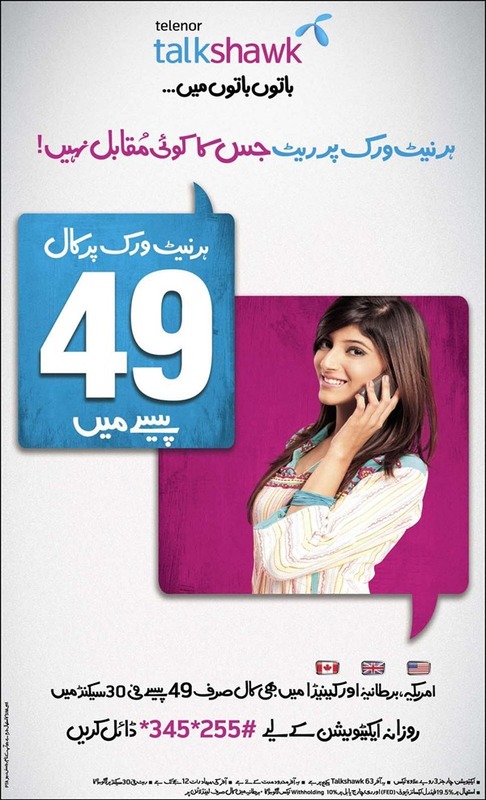 ufone 45 paisa friend and family wo baat hui k ghasiani billi gamba nochay. I have port my number to telenor. very good. But daily charges are not good.